I'm trying to create a new Superstar Sequence and save it but when I do, I get "The original file name was a standard .sup file. 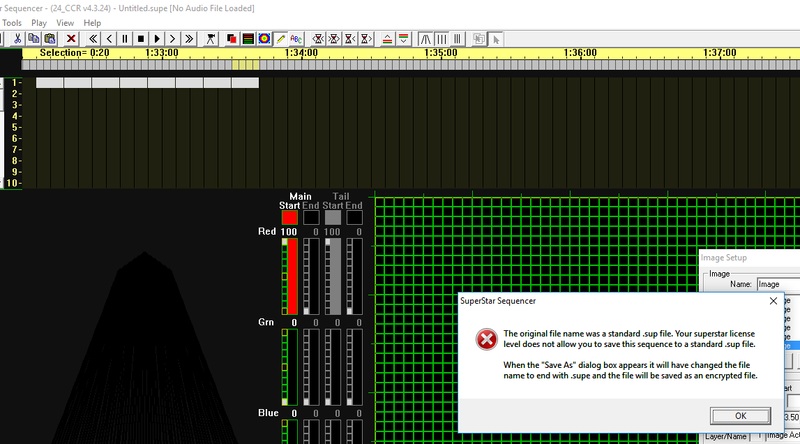 Your Superstar license level does not allow you to save this sequence to a standard .sup file." So I have to save it in a .supe file (encrypted). I have a 24 CCR license. Just trying to use the damn thing to import a GIF file and since it's not right (have to use the LARGE grid), I can't save it. I closed everything down and re-registered the software but am having the same problem. Then, when I do save it as encrypted, I pull it up and there is nothing in the file. I find this frustrating in the least since I'm just trying to do one thing and I can't because the program is now giving me fits. What the hell am I doing wrong? You see those little boxes on line 1 (track,or whatever they call it)? When I open the file back up, they are gone! ?!?! And since we are also talking about importing GIFS as animations, how come no matter what image you select in the drop down list, it always just loads the next one in the list. For example, the gif I'm working on has 8 images but image 7 is actually the first image, so when I pick which image to load (7), it loads image 1 instead. Then, when I try to load the next image (8), it automatically picks image 2 (the next one sequentially in the list). Is this broken? When it saves the sequences as an encrypted file you should be able to open it and use it the same as a normal file. It should not be doing what you are describing. Also, when importing an animated GIF it should be loading the image that you specify. Please send an email to brian@superstarlights.com and I can do a remote session and try to figure out what is happening. I am available for the next hour, if you have some time right now we can get this figured out right away. Thanks for reporting and showing me these. There is indeed a bug there, I will look into fixing it next week. So, if I download the latest version and install it, will it still have the noted issue? Yes it will. It turns out that the bug where it wants to save as an encrypted file only happens if you try to save while you are in "large" grid mode. The bug concerning the frame numbers of animated gifs happens all the time. That is, first time you open the gif it will default to frame 1, and it will use frame 1 regardless of what you manually set. Next time you open the gif it will default to frame 2, and it will use frame 2 regardless of what you manually set, etc. If you send me an email at brian@superstarlights.com I can give you more information.